New Delhi: Sad news for the Indian F1 fans is here as the chief organiser of the Indian Grand Prix has resigned, with just 9 months to go the organizers on Monday gave this statement. This was supposed to be the India’s first F1 ever. Mark Hughes, a former number two at the Bahrain circuit, in charge of building the Indian facility for the past 12 months, quit last month ‘due to personal reasons’, the promoters said. “Mark Hughes is no longer working with us, he left due to his own personal reasons,” Sameer Kumar, chief spokesman for the promoters, the Jaypee group, told AFP. “Mr Ghazali is a very capable man and he’s more than making up for Mr Hughes’s absence,” said Kumar. 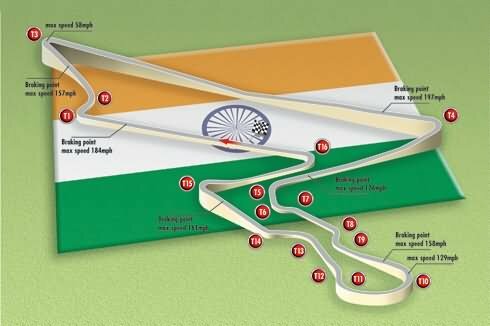 The race was supposed to be held in October 30 in the Greater Noida area, is an under-construction $350 million 5.14-kilometre (3.2 mile) circuit designed by renowned German architect Herman Tilke. The circuit is part of an ambitious 2,500-acre (1,000-hectare) sports complex being built by the Jaypee group that will include an international-standard cricket stadium. Hughes confirmed the development, telling AFP he was now working with the Yas Marina Circuit in Abu Dhabi, United Arab Emirates. “Whilst I am no longer based in India and I am working for the circuit in Abu Dhabi, I am still closely associated with Jaypee and am still advising them on the upcoming Indian Grand Prix,” he said. The promoters, whose business includes infrastructure and real estate, were confident of holding a successful race despite Hughes’s departure. Formula One has been followed closely in cricket-crazy India after local driver Narain Karthikeyan raced for the now defunct Jordan team in 2005. Karthikeyan will return to the circuit in 2011 following a deal with the Spanish Hispania racing team. There are many good F1 racers in India who were expecting a lot from the race, Karun Chandhok, finished 11th out of 12 in its inaugural year at Hispania. Mark Hughes vice president of JPSK Sports the Jaypee Group subsidiary charged with constructing the all-new circuit near Delhi is determined the race will make a major impression on the calendar. So we are building this wonderful circuit with a great deal of interest not only from spectators but also from big Indian corporations who want to know how to get involved in the sport.